If you're looking for an international escape but want to keep your passport at home, consider planning a vacation to Miami. The worldly city is located on Florida's southeastern tip. Its Cuban influence is reflected in the cafes and cigar shops that line Calle Ocho in Little Havana. On barrier islands across the turquoise waters of Biscayne Bay is Miami Beach, home to South Beach. This glitzy neighborhood is famed for its colorful art deco buildings, white sand, surfside hotels and trendsetting nightclubs. Glamour aside, the city has plenty of quality restaurants, bars and attractions to appease any budget traveler. 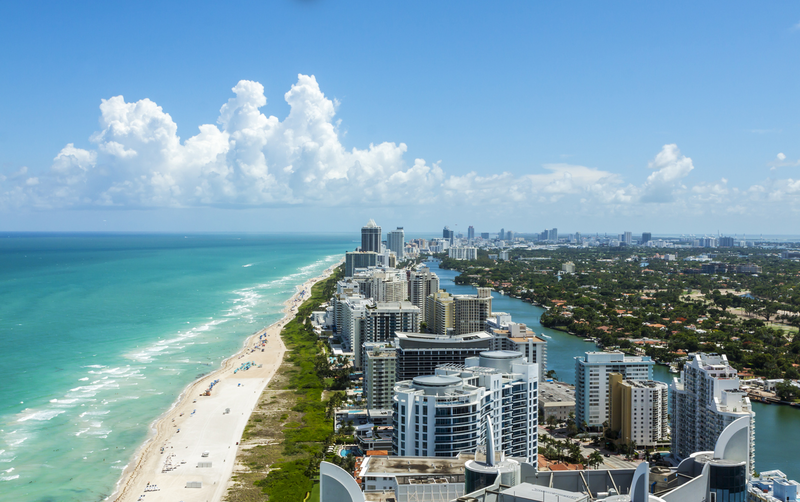 Whether you're trying to jet set ASAP or you're looking to plan your travels around upcoming deals, take a look at these forthcoming flights between Houston and Miami, which we pulled from travel site Skyscanner. We've also included top-rated hotels, restaurants and attractions in Miami, to get you excited about your next excursion. Currently, the cheapest flights between Houston and Miami are if you leave on January 20 and return from Florida on January 23. American Airlines currently has roundtrip tickets for $101. There are also deals to be had earlier in January. If you fly out of Houston on January 8 and return from Miami on January 10, Spirit Airlines can get you there and back for $179 roundtrip. To plan your accommodations, here are some of Miami's top-rated hotels, that we selected from Skyscanner's listings based on price and customer satisfaction. If you're looking to treat yourself, consider The Fontainebleau Miami Beach. The hotel has a 4.5-star rating on Skyscanner, and rooms are currently available for $399. The Fontainebleau Miami Beach overlooks the Atlantic Ocean. This property stands three miles from South Beach and Lincoln Road shops. There's also the 4.9-star rated The Mandarin Oriental, Miami, which has rooms for $299/night. A third option is The W South Beach. The 4.6-star hotel has rooms for $359/night. The W South Beach brings iconic design to the land of art deco. The best beaches and the hottest nightlife, just steps from John Collins Park, the W South Beach is located on 300 feet of pristine oceanfront property and features 408 wonderfully appointed rooms. Miami has plenty of top-notch dining options. Here are a few of the most popular, according to Skyscanner. "Joes was truly incredible," wrote visitor Shane. "Food and service were first class. We've lived in Miami for two years and always felt Joe's was a place for tourists but it's so much more than that." Another popular dining destination is Versailles Cuban Restaurant, with 4.4 stars from 94 reviews. In the heart of Little Havana lies this wonderful Cuban restaurant that so many have traveled so far to see. If you want to experience an authentic Cubano or a cafe this is the place. The colorful locals lend an atmosphere to this small, cultural institution. "This is the most famous Cuban restaurant in Miami," wrote reviewer James. "An amazing selection of Cuban cuisine with great service." Finally, there's Mandolin Aegean Bistro. Food from the Aegean region has always relied on what nature has provided. "This is a fantastic restaurant," wrote Shane. "We know Greek food well as we spend a lot of time in Crete and this was very authentic and truly delicious." Miami is also full of sites to visit and explore. Here are some popular attractions to round out your trip, again from Skyscanner's listings. Visit Vizcaya Museum and Gardens, the villa that Queen Elizabeth and Pope John Paul II have visited in the past. You can spend hours exploring the 10 acres that the villa sits on. Take walks through the gardens, spend some time at the waterfalls and fountains and take pictures at the reflecting pools. "Well worth a half-day visit," wrote visitor Shane. "The gardens are lovely and good fun for kids to run around and get lost." Then, there's Miami Design District. Historically, the Design District was the place to go for design showplaces, but it has recently been given a new facelift as a luxury walking mall. Visit interesting outdoor spaces, stores such as Vuitton, Rolex, Tom Ford, Hermes and Givenchy, and trendy, delicious restaurants. It is next to Little Haiti, Midtown and the Wynwood Art District for further exploration. Lastly, consider checking out The American Airlines Arena. Since its spectacular grand opening on December 31, 1999, the AmericanAirlines Arena -- South Florida's Waterfront Showplace and proud home to the 2006 NBA Champion Miami Heat -- has become one of the nations's premier facilities in sports and entertainment and a center of activity in South Florida.